We are in the process of staging our townhouse to sell it – what a job that is! 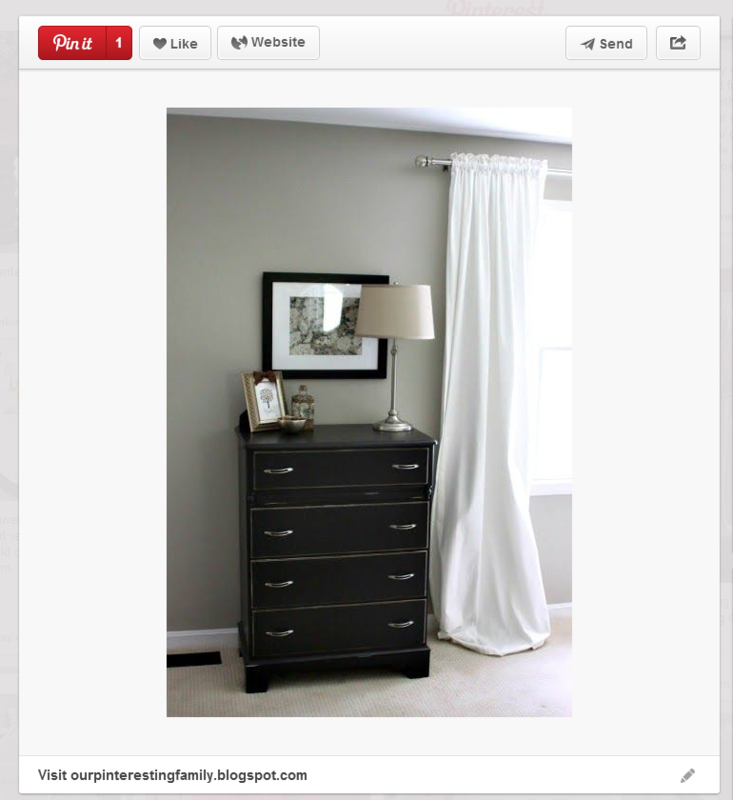 Part of that process has involved finally getting around to a small master bedroom makeover. No new furniture or anything major, but we put a fresh coat of paint on the walls and changed out the wood trim to white, and replacing the doors. Since we never actually got around to decorating the master bedroom in the first place (we’ve been married and living here together for 3 years, but my husband bought the townhouse 5 years ago), there was NOTHING on the walls. 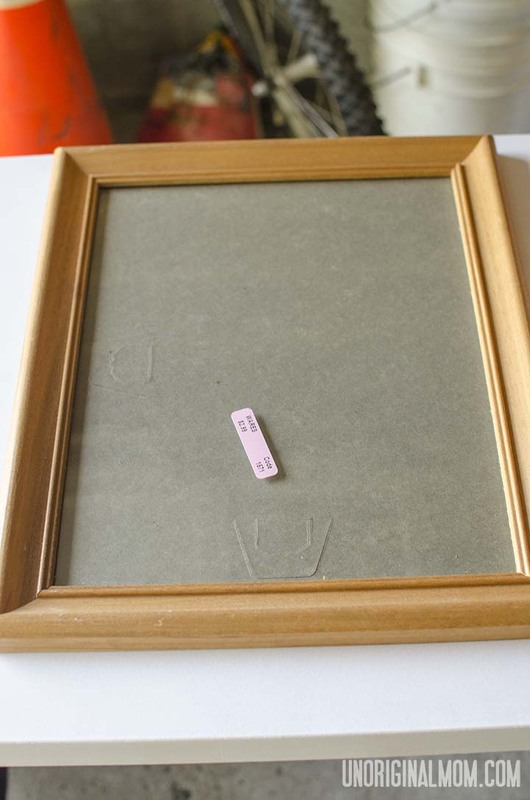 I had grand aspirations of beautifully framed wedding photos and monograms, but that hasn’t happened yet. (Next house!) 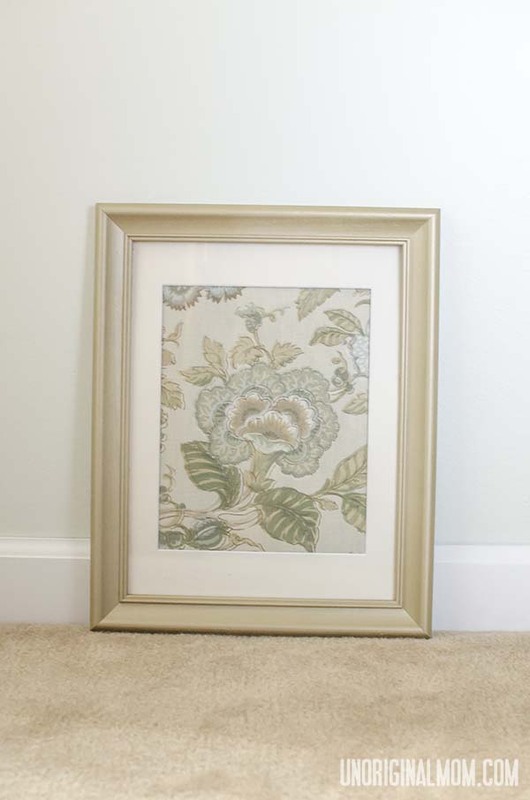 Of course, one of the most important rules of staging a house to sell is to de-personalize…so to go with our little makeover, I had to come up with some neutral, easy, and inexpensive art for the walls. 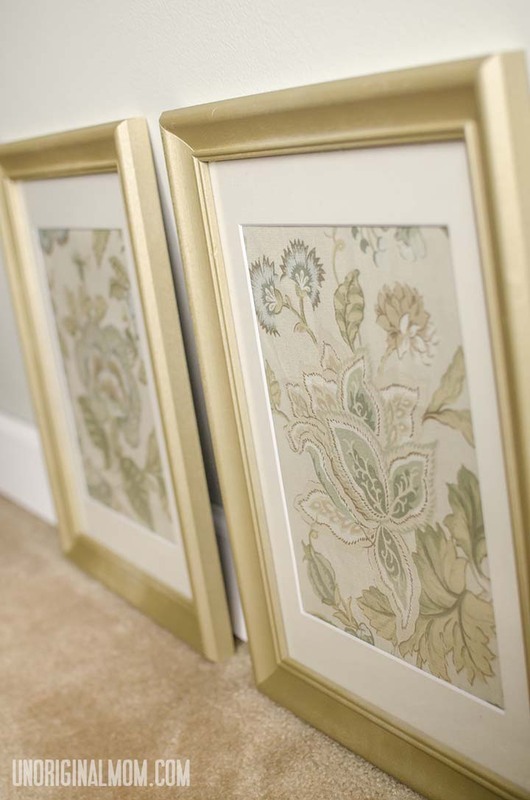 I came across this pin from Our Pinteresting Family – she framed some lovely cloth napkins from Target in a matted frame and hung them on her bedroom wall. It looks great! So I started keeping an eye out for some napkins that might work for our color scheme to create napkin wall art. …and gave them a coat of spray paint. Then I found some perfect cloth napkins at Ollie’s (a discount overstock bargain place in town) for $4.99! I also picked up some inexpensive photo mats at Michael’s. From there, the process was simple. After ironing the napkins VERY well (I’d recommend using some wrinkle spray or starch to get the creases out), I cut them to size, centering them on the part of the napkin I wanted to display. Luckily, the pack of four napkins had two similar but slightly different prints. 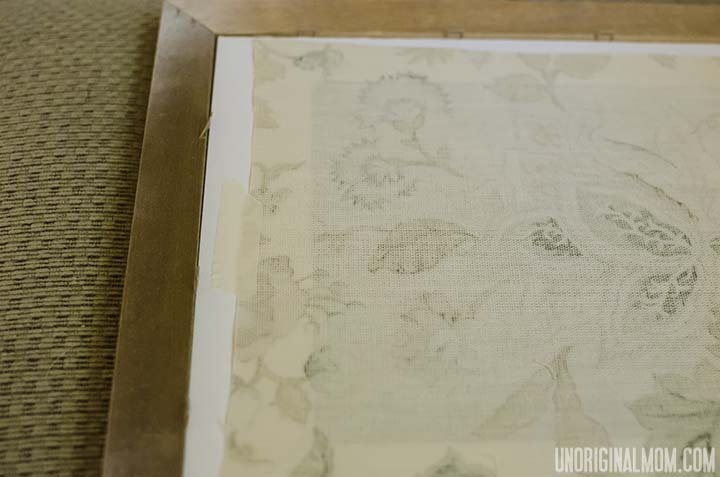 I used masking tape to secure the fabric to the photo mats so it laid completely flat. And, presto! 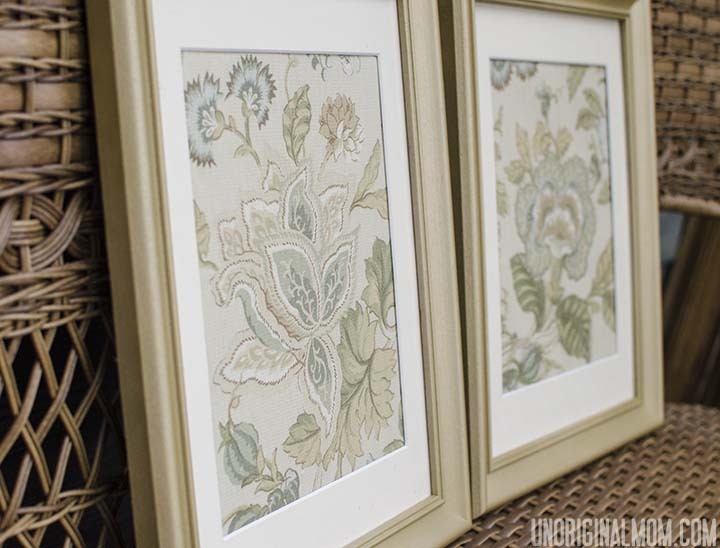 Lovely, neutral, and CHEAP wall art! 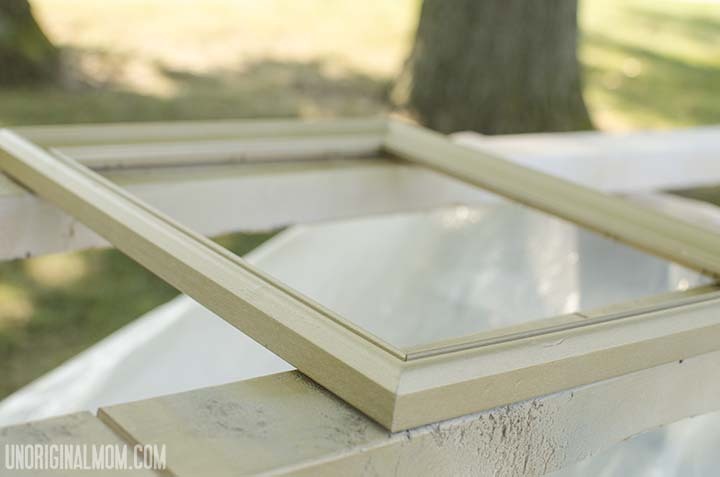 Between the frames, napkins, photo mats, and spray paint, this project cost less than $12! 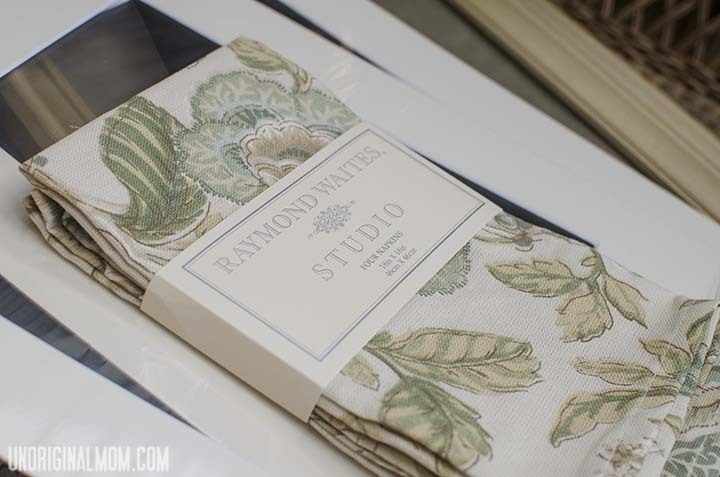 I think these napkins were a perfect find for our color scheme and feel! 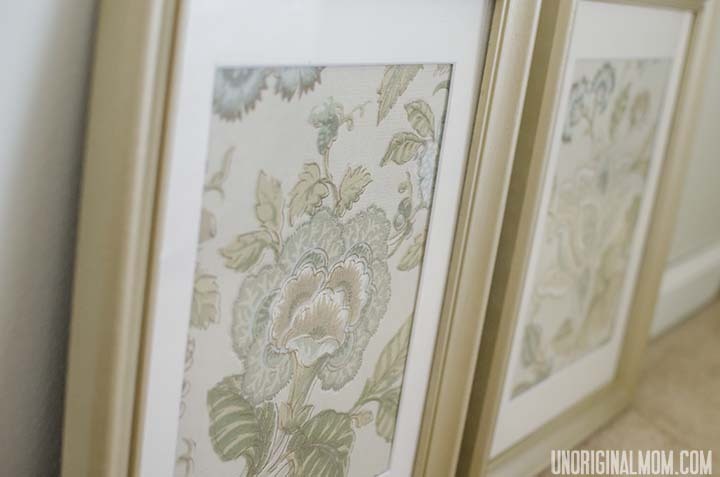 If you’re looking for quick and inexpensive wall art, either to stage your house to sell it or just to add some variety to your decor, this is a perfect solution! 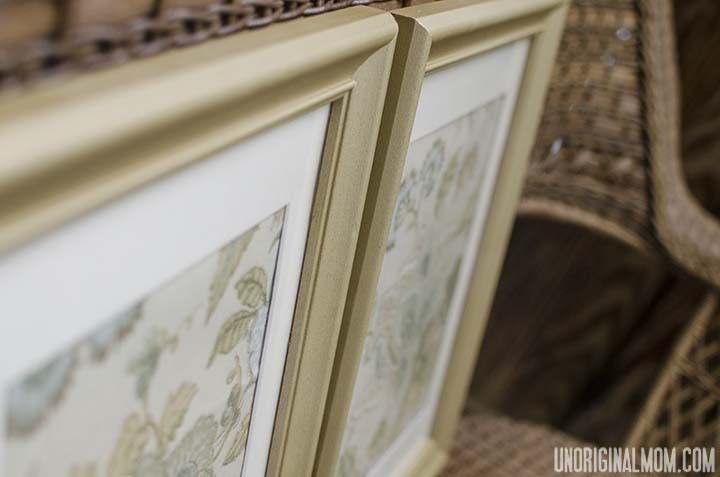 Stay tuned in the coming weeks for more peeks into our ready-to-sell house as well as some other staging tips & tricks! Your napkin art is adorable. I love the print but I would never have thought of napkins. I could see using this in a bathroom or kitchen and using the left overs to trim towels. I did a post this week on art as well. I would love it if you would check it out. What a great idea ? Another amazing idea to use napkins ! I swear I have very similar napkins; but this is super clever idea. And so beautiful. Thank you so much! These look so classy and expensive! Beautiful. I truly believe cloth napkins were meant for crafting, not for wiping haha! These are so beautiful and look professionally made. Well done! Great job, and what a fabulous idea! Trying to neutralize our house for sale now. It is a huge process. Will definitely be on the lookout for some napkins or pretty fabric. Thanks! Thanks! I’m glad you found it helpful! Best of luck with the monumental task of selling…it is such a HUGE relief when it is over and done!